Yorkshire coach Jason Gillespie is under no illusions that his team must dust themselves down after their shock County Championship defeat to Middlesex, and be in the right frame of mind mentally to take on Birmingham Bears in the NatWest T20 Blast at Headingley tonight. Vikings’ palpitating win over Lancashire, in front of a capacity crowd at the same venue a week ago, has boosted their confidence in this form of cricket but Gillespie knows there is still a mountain to climb after some poor performances in the first half of the programme. One large crumb of comfort to be taken from the Roses triumph was that it lifted Vikings off the bottom of the North Group table but second-placed Birmingham are bound to be tough opponents. “It is a big game, there is no doubt about it, and there is no secret formula for success,” said Gillespie. “’Win’ is the operative word and we must go on winning if we are to qualify for the quarter-final stages. “I just don’t think we have scored enough runs so far or bowled well enough, it is as simple as that. The good news for Vikings is that they have Liam Plunkett, Adil Rashid and David Willey back from international duty as well as Gary Ballance who has regained his Test place and along with Joe Root and Jonny Bairstow is in the England squad to take on Pakistan in the First Investec Test at Lord’s, beginning next Thursday. The Vikings are back to strength not a moment too soon because on Sunday they take on Derbyshire Falcons at Derby, the game having been switched from Chesterfield because of the saturated state of the field at Queen’s Park. The matches come just too soon to include their star signing, 22-year-old Australia batsman, Travis Head, who will join up with his new team-mates over the weekend. The South Australian, who worked under Gillespie with Adelaide Strikers in Australia’s Big Bash and helped propel them to the semi-finals with 299 runs in nine innings at an average of 42.71, will be with Yorkshire in London where they play Surrey in the Championship,” starting on Monday. 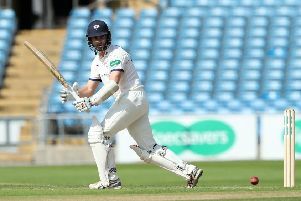 “Travis will get to know the lads and have some nets and he should make his debut for the Vikings against Notts Outlaws at Trent Bridge next Friday,” said Gillespie. Vikings (v Birmingham Bears at Headingley tonight and v Derbyshire Falcons at Derby on Sunday) from: A.Z Lees (captain), G.S. Ballance, T.T. Bresnan, B.O. Coad, A.J. Hodd (wkt), J.A. Leaning, A. Lyth, S.A. Patterson, L.E. Plunkett, Azeem Rafiq, A.U. Rashid, W.M.H. Rhodes, D.J Willey, K.S. Williamson.